A 5"x7" custom ink illustration of your home or a special building -- just send me a photo of the building you'd like me to draw. 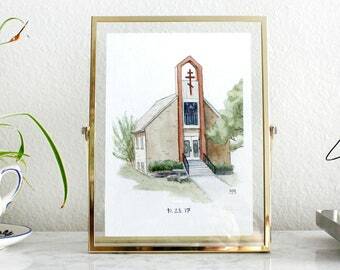 This is perfect for a housewarming gift, wedding gift, graduation gift, or just a little something to remember your childhood home. 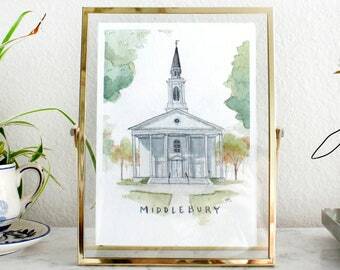 It would also make a lovely sentimental gift for an engagement. 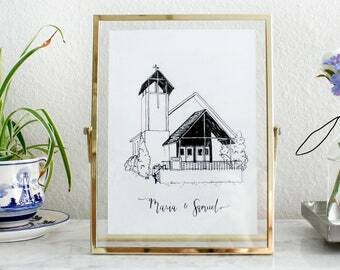 Your unique custom ink illustration will be made with love on high quality, smooth Bristol Board (cardstock). I draw every illustration by hand. 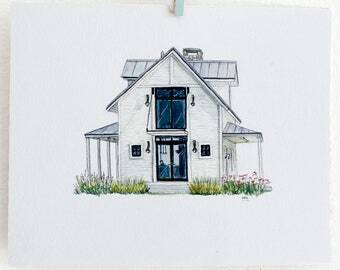 Your pen and ink house portrait will be drawn in black archival quality, waterproof ink. 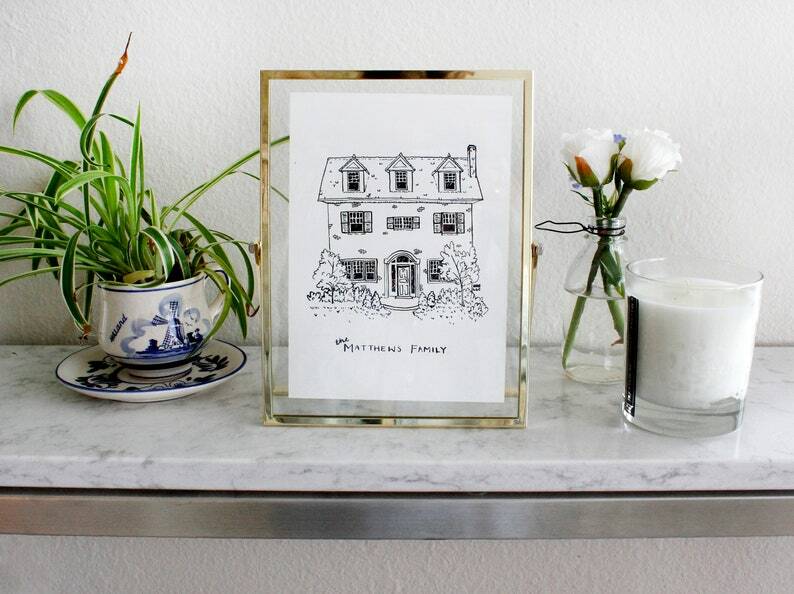 To order: just purchase the listing and send me a photo of your home through Etsy Conversations! If you would like to include any labels (Last name, date, address, etc.) on the illustration, just let me know. Please check my FAQ section for information on my turnaround times, shipping, and more. Absolutely perfect. She even included our dog and box woods. Will definitely be reordering gifts in the future! 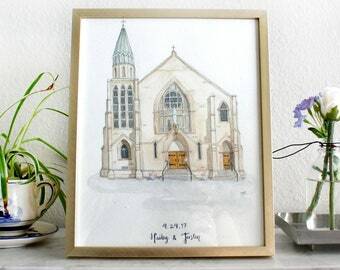 How long until I receive my custom illustration? 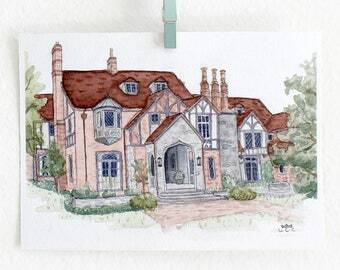 My standard turnaround time for custom watercolor and ink illustrations is 2-3 weeks. If my processing time is longer than this, it will be reflected in my shipping estimates, and I will do my best to inform you of it. I always ship via priority mail, to ensure a timely and reliable delivery. I often offer a rush fee add-on, which will show up as a listing within my store, when available. Purchasing the rush fee along with your order will ensure a 1 week turnaround time for your order (not including shipping). Yes, I can include pets in my home portraits (at no extra cost). Just send me their photo along with the house photo(s) once you place your order, and let me know if you have a particular placement/pose in mind. I ship via USPS Priority Mail, which takes 2-3 days to arrive. If you choose Express shipping at checkout, this will not affect turnaround time, but shipping will take only 1-2 days, guaranteed. Will you send me a proof before shipping my illustration? It's my policy not to offer proofs, but I am happy to discuss details and specifications to make sure I can make a composition you'll love. If you order a digital version add-on for your illustration, I will send that to you as soon as your order is shipped. Can I reprint my digital for invitations or merchandising? Please feel free to use the digital version of your illustration for personal use, such as wedding suites, reprinting a second copy, or digitally sharing. I kindly ask that you do not use my illustrations for commercial use, without my express permission. Please do not use my work without my release for items you intend to sell, including but not limited to books, T-shirts, postcards, and prints. Do you offer any other sizes than 5x7" or 8x10"? For both my ink illustrations and my watercolors, I can do any dimensions up to 14x17". If you are interested in a custom size, please message me for a quote. Please note that for sizes larger than 8x10", I charge $8 shipping.